DJ Dal is becoming the name for all special occasions, you cannot escape from his name on social media. With his big following across his social media accounts he truly knows how to keep engagement and interaction. He is so great in creating content for his fans! Be it free CD remix giveaways, taking us into his party world on Snapchat, giving us a free party from Youtube and Live Facebook! This DJ knows what’s good! 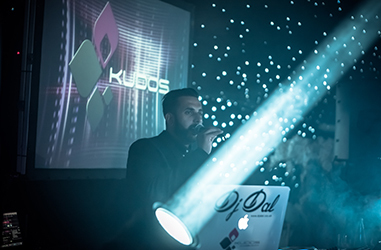 Recently, DJ Dal from Kudos has not only been embarking his musical journey with the likes of AJD, DJ H, Jas Johal, Rajeev B & DJ Dips at events, weddings and parties but he has been travelling worldwide! DJ Dal is part of the renowned, biggest luxurious wedding and party providers Kudos Music. It goes without saying but almost most weddings or parties you attend now has a Kudos element. That may be a Kudos Grand Portrait, Kudos Signature Visual, Kudos AV and plenty more. These packages are a must and they surely add that touch, elegance and wow factor to your special day. 2017 is pretty much booked for us up and down the country. However, we have some dates left so contact us now before the dates go! 2018 is looking very promising and already getting bookings for our packages and DJ Dal. So many ways to connect, you can email or call him or even contact him via the numerous social media accounts.